Mostly, floral prints derived from the classic Hawaiian shirt, but floral motifs are hitting the limelight once again for spring/summer fashion 2014. Most would associate flower prints with the female wardrobe, however, the floral print comes into its own when worn with confidence and charisma. 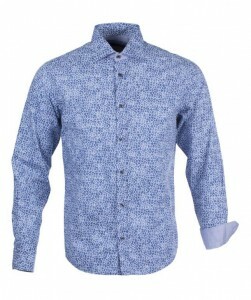 If you’re not one to shy away from a bold print then look to menswear designer clothing, Guide London who are offering a great range of seasonal floral printed shirts. A small glimpse of petal exudes great charm, so when smartening up for a date the London Guide floral printed material will help keep your outfit looking sharp and contemporary. If you’re easing into the floral trend, we recommend the London Guide Floral Printed Shirt in blue. Its wearable floral pattern is made up of tonal blues making this piece cool and subtle. This long sleeve, semi-slim fit mens shirt also features colour coordinated buttons, a cutaway collar detail, and contrast trim under the cuffs. 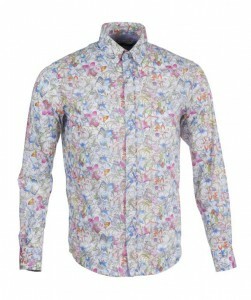 Guide London have paid impeccable attention to detail when it comes to this Lilac Floral Printed Shirt. The truly British menswear brand have featured an exciting mix of colour and fabrics along with a complimentary floral pattern. You’ll find lilac tones on the inner collar and stitching. 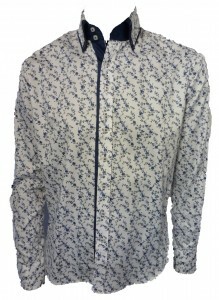 Another one of our favourites from Guide London designer clothing is the Retro Print Shirt. This Guide London shirt takes a nod to the past with its sixties psychedelic print. The all over retro printed design is made up of a multi-coloured mini squared mosaic to form its striking retro lattice pattern. The Mod-styled fitted shirt has also been tailored with a cutaway collar and neat cuff detail. Double up this spring with one of Guide London’s double collar shirts. New to Apache is the Guide London Double Collar Floral Shirt. It features a double button-down collar with navy contrast lining, which neatly accentuates the blue floral printed design. For a more vintage feel, look to the Guide London Paisley Shirt. 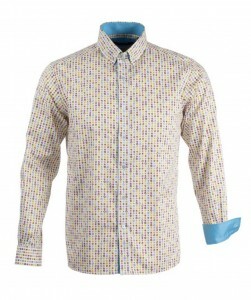 Explore the collection of Retro-Printed and Floral Guide London shirts from Apache Online, UK.